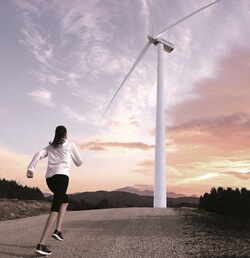 Siemens Gamesa Renewable Energy introduces new onshore platform Siemens Gamesa 5.X, which encompasses two turbine models: the SG 5.8-155 and the SG 5.8-170. The platform has the largest unit capacity in the Siemens Gamesa onshore portfolio, 5.8 MW rated capacity, and the largest rotor diameters, 155 and 170 meters, resulting in maximum performance in high-, medium- and low-wind conditions. The 170-meter rotor is the largest in the onshore segment. The SG 5.8-155 expands the swept area by 14% with respect to the SG 4.5-145, and Annual Energy Production (AEP) by over 20% (@ 8 m/s); the SG 5.8-170 provides an increase of over 37% in the swept area and more than 32% in AEP (@ 7 m/s) when compared with the SG 4.5-145. With a highly flexible design that enhances the entire value chain, from manufacturing through logistics to construction and service, the platform’s versatility makes it suitable for a broad range of sites. These wind turbines integrate the hallmarks of Siemens Gamesa technology, such as a doubly-fed generator, partial converter and a compact drive train designed with a three-stage gearbox. Additionally, compliance with the most demanding grid-related connection requirements is ensured by the inclusion of an optional premium converter. Mark Albenze, Onshore & Service CEO at SGRE, said: “The new Siemens Gamesa 5.X's high and flexible power rating coupled with the two rotor options make this platform suitable for any kind of site across the globe. Designed for future modular upgrades to meet the evolving demands of the market, it will allow the company to assist customers in reaching their profitability goals through best-in-class performance and LCoE”. A first prototype installation of the SG 5.8-155 is planned for mid-2020, and production is scheduled to commence in Q4 2020. For the SG 5.8-170, the first prototype is planned for Q3 2020 and production will start in Q1 2021. Siemens Gamesa Renewable Energy has been awarded the Brazilian Development Bank Special Agency for Industrial Financing Certificate for its SG 3.4-132 onshore wind turbine, which is produced in the factory located in Camaçari, Brazil.